If the organizers of the national prayer breakfast ever want a sitting president to attend their event again, they need to expect that any leader in his right mind is going to ask — no, demand — that he be allowed to see a copy of the keynote address that is traditionally given immediately before the president’s. 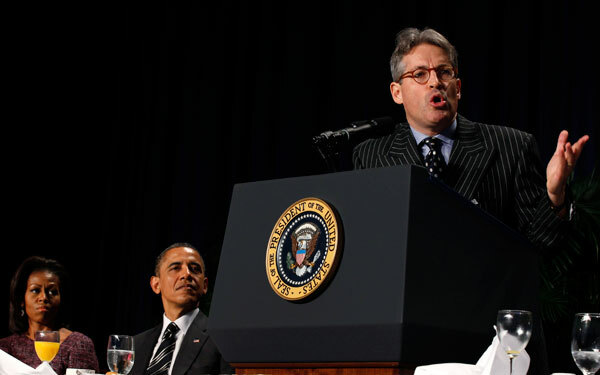 That’s how devastating was the speech given by a little known historical biographer named Eric Metaxas, whose clever wit and punchy humor barely disguised a series of heat-seeking missiles that were sent, intentionally or not, in the commander-in-chief’s direction. Although Obama began his address directly after Metaxas by saying, “I’m not going to be as funny as Eric but I’m grateful that he shared his message with us,” both his tone and speech itself were flat, and he looked as though he wished he could either crawl into a hole or have a different speech in front of him. In fact, one could be forgiven for thinking that somehow Metaxas had been given an advance copy of Obama’s talk, then tailored his own to rebut the president’s. Obama has been under pressure for some time now to somehow prove his Christian bonafides, for it’s no secret that millions of Americans doubt his Christian faith. A Pew Poll taken in 2010 found that only one third of Americans identified him as a Christian, and even among African-Americans, 46 percent said they were unsure of what religion he practiced. Obama came to the prayer breakfast with a tidy speech that was clearly designed to lay those doubts to rest. He spoke of his daily habit of prayer and Bible reading, his regular conversations with preachers like T. D. Jakes and Joel Hunter, and even told a story of the time he prayed over Billy Graham. “I thought I was a Christian. I guess I was lost,” he matter-of-factly stated. “Keep in mind that when someone says ‘I am a Christian’ it may mean absolutely nothing,” Metaxas added for good measure, in case anybody missed his point. The eerie feeling that Metaxas was answering Obama on a speech he had yet to give continued, as he spoke about the uniqueness of Jesus Christ and the Christian religion. Moments after Metaxas finished his speech and sat down, Obama took great pains to describe the other great religions of the world as mirroring his own Christian faith. Translation: Christianity is great and so are the other major religions, which essentially teach the same stuff. I agree – God is not fooled. Great post! The problem with any president is that he/she will be human and therefore imperfect. From a distance the republican choices seem to be just or even more “human”. In the meatime time we are to honour our leaders and pray for them. Romans 13 is always a sobering reminder. I loved Metaxas’s Bonhoeffer book. After reading about this, I just became the guy’s biggest fan! Many people have enjoyed reading that book. And I’m not fooled by Metaxis, who proved in his brilliantly written book on Bonhoeffer, that he actually knew nothing about the man, and that he was totally bereft of Christian discernment himself, by elevating Bonhoefer to sainthood status, when he was in fact a murderer and a social/socialist engineer, who paid scant attention to the truths of the Bible. Metaxis must surely place himself in a similar position, if he cannot see where Bonhoefer was wrong and if he thinks that the Bible is only, or largely about so-called ‘social justice’. Now i need to read that book.